(CNN) - Former Republican Massachusetts Gov. Mitt Romney thinks Sarah Palin would be "great" as a candidate for the GOP presidential nomination in 2012. "I believe she is an extraordinarily powerful and effective voice in our party, that she has generated a great deal of support and attention, that she'd be great in a primary process," Romney said Tuesday on CNN's "Piers Morgan Tonight." "She'd bring attention to the process, and frankly, the more people we have on the stage in those debates talking about different ideas and different approaches, the better." Although he wouldn't speculate on whether he could beat her in a potential matchup, he was quick to volunteer the opinion of his wife, on his run. 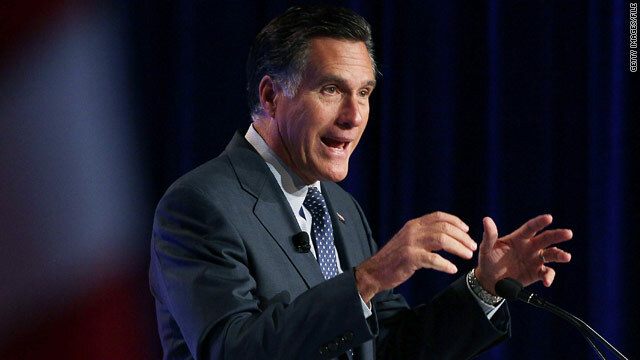 "My wife thinks I should run, she's absolutely committed," Romney said. "I'm not sure she knows whether I can win or lose, but I know she feels that somebody of my experience is needed in the country at a time like this." Even though the former 2008 presidential candidate said he too would have lost to Barack Obama in the last election, if he were president now he would "reverse all of the policies that have made America one of the least friendly places to start new businesses." "This administration, while saying they hope to make things business friendly, have done just the opposite," Romney said. He also would not label Egyptian President Hosni Mubarak a "dictator." "He is the leader of his country, he is a monarch-type figure," Romney said. "I probably would avoid the term 'dictator.'" While Egypt experiences dramatic political changes – including the announcement from Mubarak that he will not seek reelection – Romney said it is important that America stand with democracy but not impose an American system in other parts of the world. "This after all was an administration which has been friendly with us, has had agreements with us to protect the stability of Israel, our ally," Romney said. "We can't just say we're going to rip everything apart and fashion your nation the way we'd like it to be." Of course we all know what they are up to...it is all about getting the votes. President Obama never called him a dictator. He certainly never said we were going to rip everything apart and fashion a nation the way we want it to be. Those are your words. That's why you will never stand a chance of being President. As far as being business friendly we are still waiting on the Republicans for all those jobs that were to magicly appear if they got their tax cuts for the rich. At least we see President Obama going to factories and trying to get jobs. He is skirting around the Palin issue. My God where do you get these headlines? Romney looks presidential, and Palin looks good–nay, hot–but how well was Romney thinking to say "great" in reference to her presidential candidacy? She is a strong leader for conservatives. Sometimes I agree with her positions, but often I oppose them–a lot! So she's "mixed" on positions for someone as conservative as I, and Katie Couric, now, did go and ask Sarah all those old hard questions, and in public, too. Maybe it was just too early in the morning, or too late at night, when Romney spoke about the pretty lady's being a good candidate for my party. Gee Wink, we'd like to buy a vowel. Game show host, and his assistant running the country. What a joke. cnn, it's February you continue to sneak the AK imbecilic moron in your stories. Where's Whitaker when you need him? Memo to mitts – you will NEVER be president because you flip flop every single day. If you really and truly think this woman can be president your worth just dropped to the low IQ class of Americans who think she really matters except to those gun people who still think she hunts and the trailer trash/lower class. Sarah Palin does attrack a great deal of attention, so does a 10 foot Alligator walking down a street, this does not mean either ids qualified to be president. Simply because she has supporters, and can generate a lot of money and attention does not qualify her to be president. Only when this country can finally choose someone based on something more than snappy slogans and looks, one that does have both a good to great education and a lot of common sense and is more concerned about the country than his or her party will the country move forward. In other words she'd be great in the primaries to get people involved and curious about the REAL contenders to the throne. She can be counted on to draw in the crowds much like the freakshow drew the curious at the carnivals. Romney/Palin 2012. I'll even throw in her witch doctor for free! Romney, you stupid Rich Moron!!!! He,s a Church leader,not a politician! You republicans are going to vote for these shisters,why in the world would you want to destruct this country again???? Your the culprits! Evangelical vote will be a disaster for the country!!!!!!!!!!!! Stay in church !!!!! You want women to have no rights to have a child,but you let 100,000 people a year die with no healthcare or drug assistance. This guy is a Nutcase!!!!! Wow it is amazing how the media and politicans go all out not to call Palin "DUMB" but waste no time in calling President Obama dumb. I guess being white and female does have it priviledges. Of course Romney wants Palin to be on the primary stage. Everytime she opens her mouth, and the word salad and ideological diarrhea spews forth, she'll make him seem like a palatable choice. Every time I read of this woman's name, I think of the word 'rogue' that she chose to describe herself in her book. Rogue has different meanings, most of them are negative. Unprincipled, destructive, to defraud, a deliberately dishonest person, a cheat, without honor or virtue. She told the nation, up front, what she is about. Whatever little credibility Romney had he just lost it. Why are all of these people so afraid of Palin? I would never vote for Romney (or any of the current Republican contenders), BUT, I will give him credit for being articulate and a savvy businessman and for being a governor that actually finished a term. Palin on the other hand, is the most incoherent, vitrolic, airhead to ever appear on the national political stage. I cannot fathom why she is still relevant. Please tell me 1 policy proposal she has offered? None. All she does is tweet hate mongering jibberish that sounds like something that would come from a 16 year old. And she is a legitamite Presidential contender? We need serious help if that woman somehow gets the nomination....though at least in that case Obama would have clear sailing to a 2nd term...so maybe it wouldn't be all that bad for her to run. If Romney really believes this about Palin then he is definitely not qualified to be President.